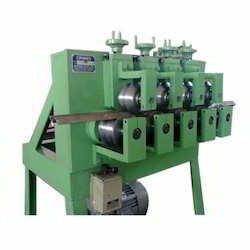 We are engaged in manufacturing and supplying of wide range of Section Straightening Machines. These compact sized machines are robust in construction and ensure maximum durability and sturdiness. Machine function is to straighten various deformed products such as channels, flats, I-beams, squares etc. is based on a well proven rotary straightening process. We are among the topmost companies indulged in the manufacture, supply and export of supreme quality Section Straightening Machine throughout the market. We bring to our customers a very wide gamut of models and designs in this category. These machines are very effective and give superlative performance for a fairly long time. The roller section straightening machine is most suitable for straightening of any rolled, drawn or extruded ferrous and non-ferrous in cold condition. This machine is engineered to give trouble free long life service. The body and base of are fabricated from mild and steel and steel plants duly stress relied and machined as per design. Fully automatic, semi automatic or manual operating option as required. To cater to the diverse requirements of our esteemed clients, we have in store with us an assorted gamut of Section Straightening Machine (500MM) in a variety of customized options. Fabricated using high grade raw materials & components, our huge range of straightening machines are engineered to perfection, following industry quality norms. We offer a wide range of Section Straightening Machine for square & for bright bar. It is use for cutting and polishing. It is first of its kind manufactured. It gives bar drawing, straightening of any rolled, drawn, ferrous or non ferrous solid section in cold condition. This machine is engineered to give trouble free long life. To keep the extensive array of products safe till final dispatch, we have a well-structured and organized warehouse that is well maintained by veteran professionals. Backed by efficient logistics team, we make deliveries of the goods in the set time span. Model ID: SSM-1 Bhambra Engineering Works offers Section Straightening Machines, SSM-1. The electrical detail of SSM-1 is 5.5 K.W. / 1500 RPM / 415V. - Frame: The frame are of Heavy Duty construction from plates and consists of two housing between which is placed the distribution gears to the rolls shafts. The gears are hardened running in oil bath. - Drive: All bottom rolls are driven, all top rolls are idle. Owing to our advanced facilities, we have been able to bring forth an immaculate collection of Section Straightening Roll at competitive prices. Price Details Price may vary as per the size and material. - 40000 Rs. To 1000000 Rs. Per Piece. We offer high performance Section Straightening Machine that are known for quality, efficiency and durability. This machinery is designed by our team of engineers and technicians taking immense care and using latest technology. These products are highly effective and have the ability to work in any conditions.